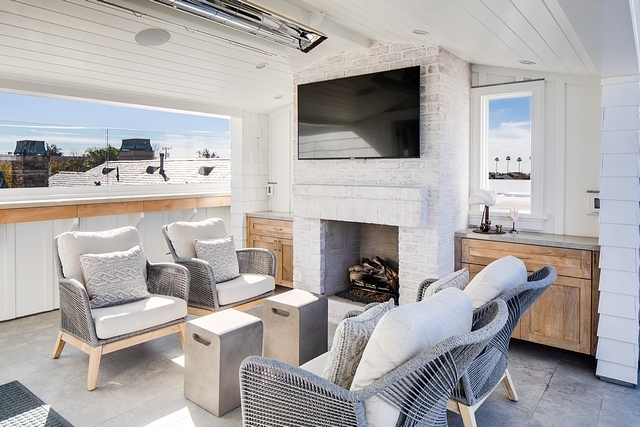 With interiors by Anne Michaelsen Design, built by Patterson Custom Homes and with architecture by Brandon Architects (recently featured here), this small lot beach house is located in Corona Del Mar neighborhood of Newport Beach, California. 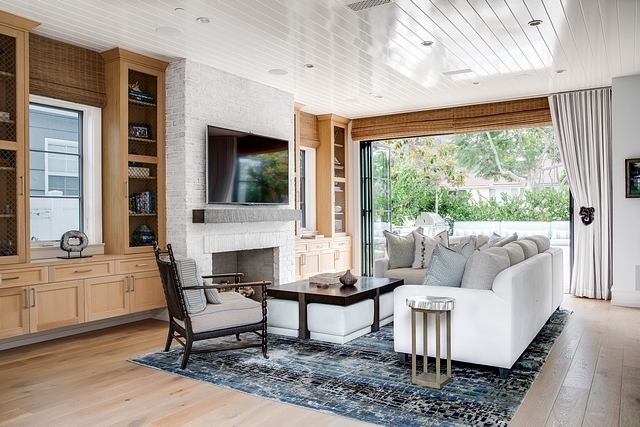 According to the designer, the homeowners (an Orange County couple with adult children that live outside of the home) were looking for a relaxed California seaside/coastal look without being too obviously beachy. They wanted the home to be comfortable enough for everyday living, while still being elegant enough for entertaining guests or throwing a party. The homeowners wanted seamless indoor-outdoor living throughout the home which is achieved by steel doors that completely open up onto the front and side yards and a rooftop lounge with several seating/entertaining spaces, a dining table, and outdoor kitchen/BBQ which has views of the Pacific Ocean and beautiful Corona Del Mar. Additionally, it was important to them to have interesting and unique interior pieces and styling in order to set the home apart from other similarly designed homes in the area. 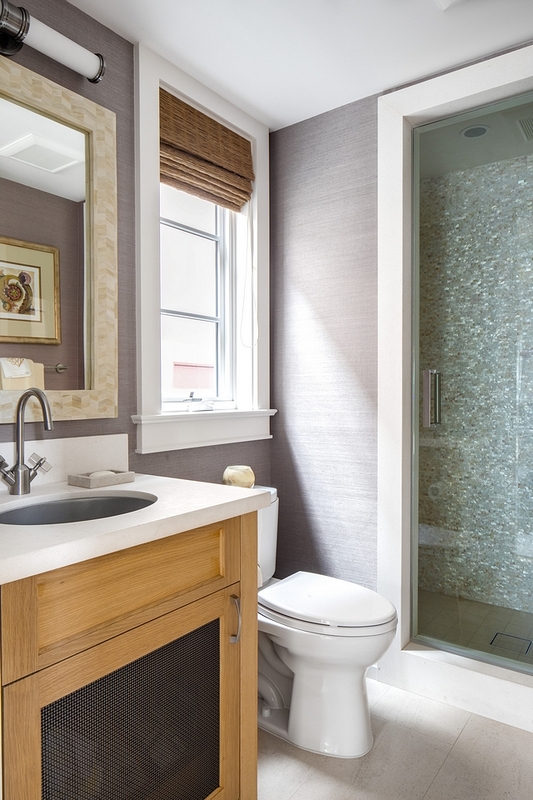 They love shades of lavender and purple, which you will find throughout the home sometimes in unexpected ways (for example, the marble shower has hints of purple). 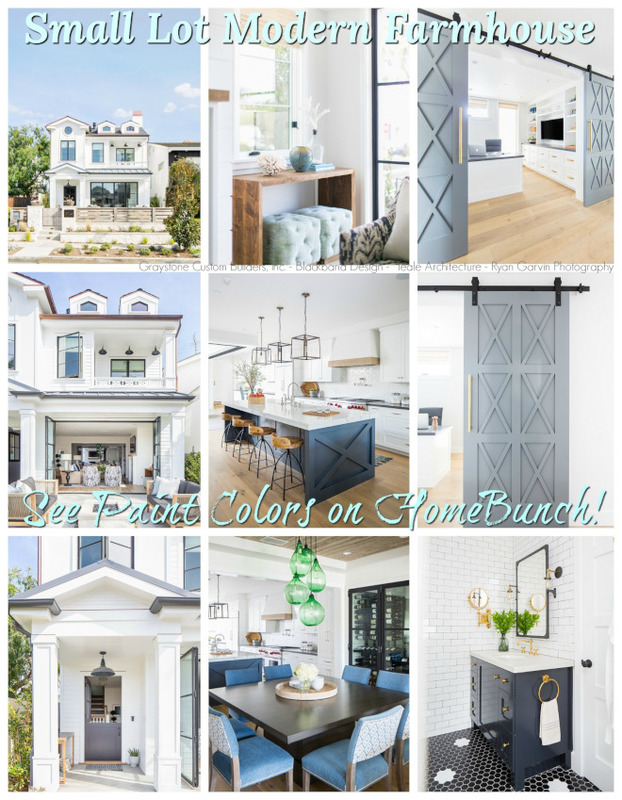 To complete the seaside look, the designer complemented purple with blues and greens in paint color, furniture, and decor throughout the home. 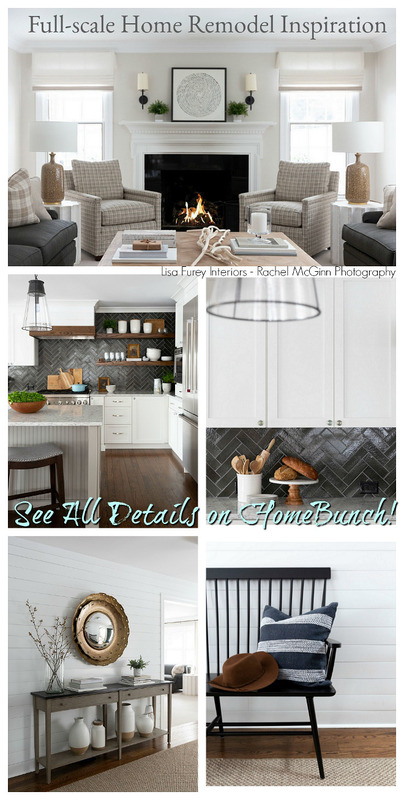 Find a comfy chair and have a great time seeing this beach house! 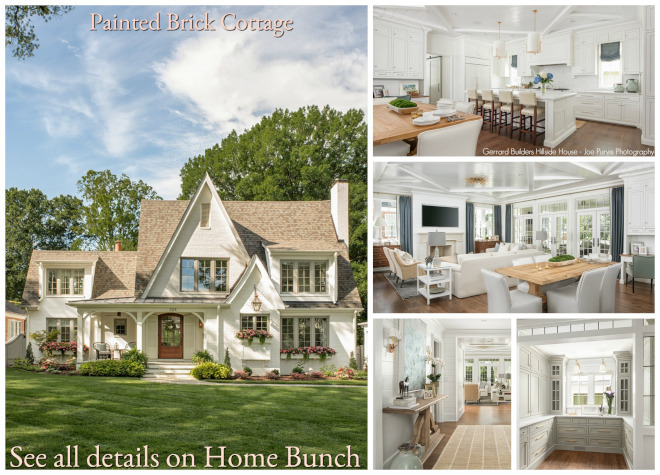 The exterior of this home features a combination of Limewashed brick and double dipped shingles. Each shingle is dipped before installation rather than painting after installed. Also, notice the beautifully curved balcony. Windows & Doors: Euroline steel doors and windows. Roof is made of zinc. Ample seating with similar color scheme as interior to a consistent flow from exterior to interior. Exterior Sconces: Urban Electric Co. – Other Affordable Options: here, here, here, here & here. 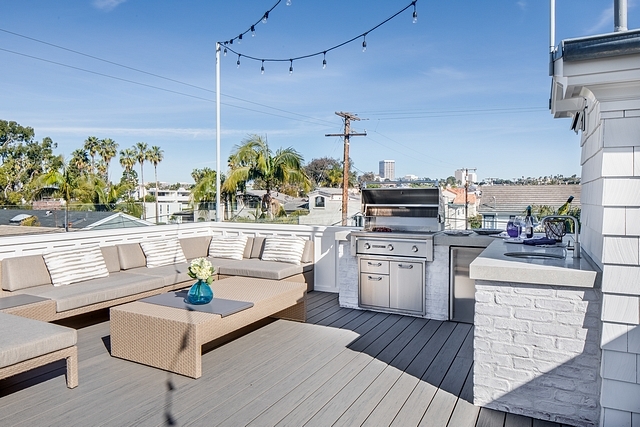 The front patio has a built-in BBQ, burner, built-in beverage cooler and under counter storage. 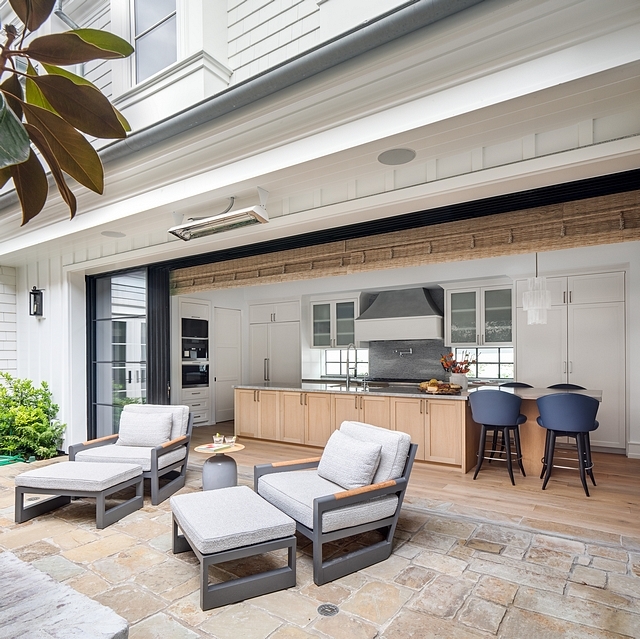 The built-in bench features outdoor cushions in Sunbrella fabric. The custom firepit features limewash brick and weathered granite. 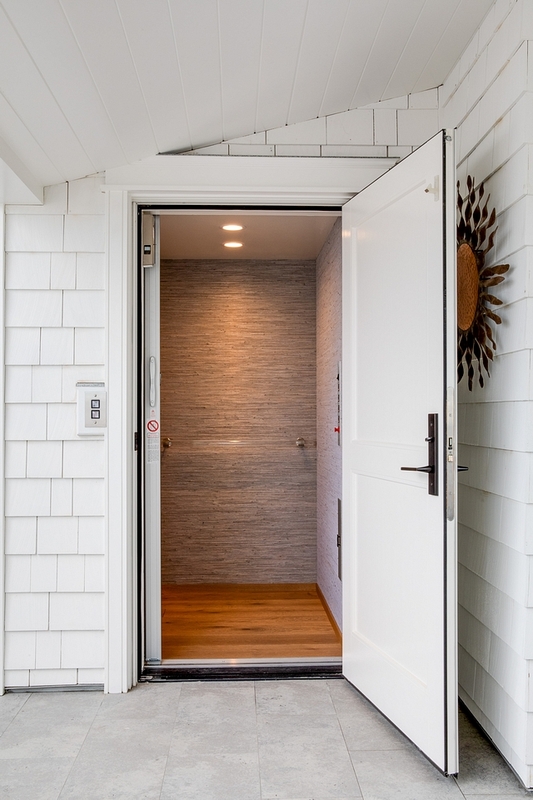 The front door was custom made to be able to open as a typical dutch door in the center but also to open just at the top ¼ of the door so it can be open when its hot but also prevent the cats from escaping out the front door. 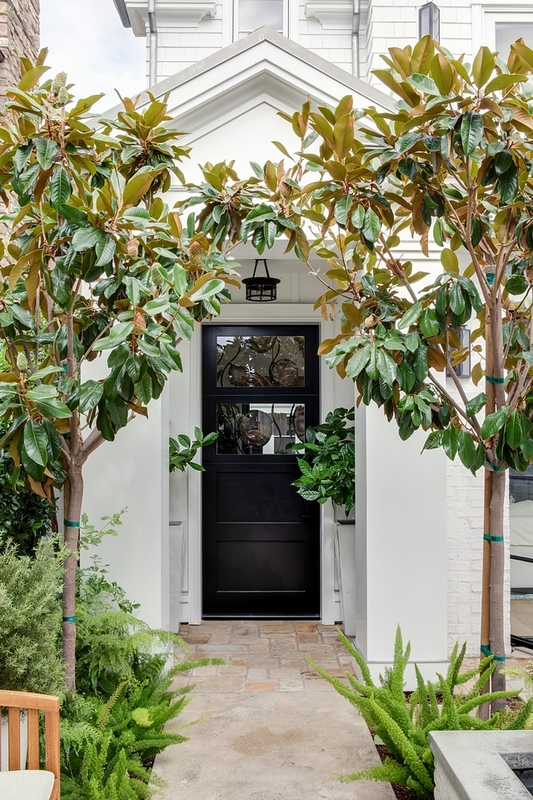 Similar Black Door Paint Color: Benjamin Moore Onyx. Front door hardware by Emtek. 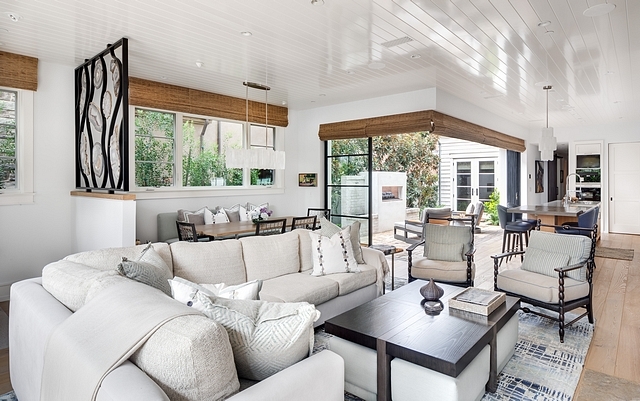 The first story ceilings are T&G in semi-gloss Atrium White by Benjamin Moore. Coffee Table: To maximize the use of the space we selected a coffee table with 4 ottomans that nestle seamlessly under the table. Table by Marbello Designs and ottomans upholstered in Glant fabric. The Great Room features custom curtain in Zimmer & Rohde’s Edgar and custom drapery holdbacks made of natural Agape. 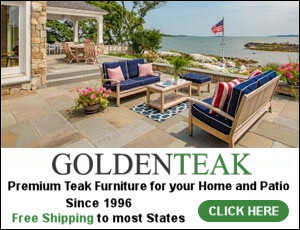 The sofa was designed to have two looks: Upholstered or with a slipcover; upholstered in a cozy neutral Glant Fabric’s Treviso and suede with a durable stain resistant soft aqua Glant fabric slipcover for protection from cats and stains. 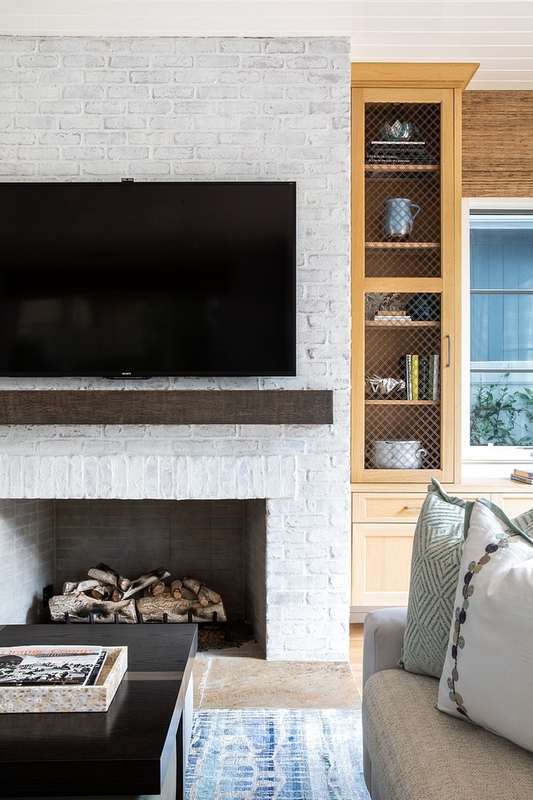 This space also features a stunning brick fireplace flanked by custom cabinets. 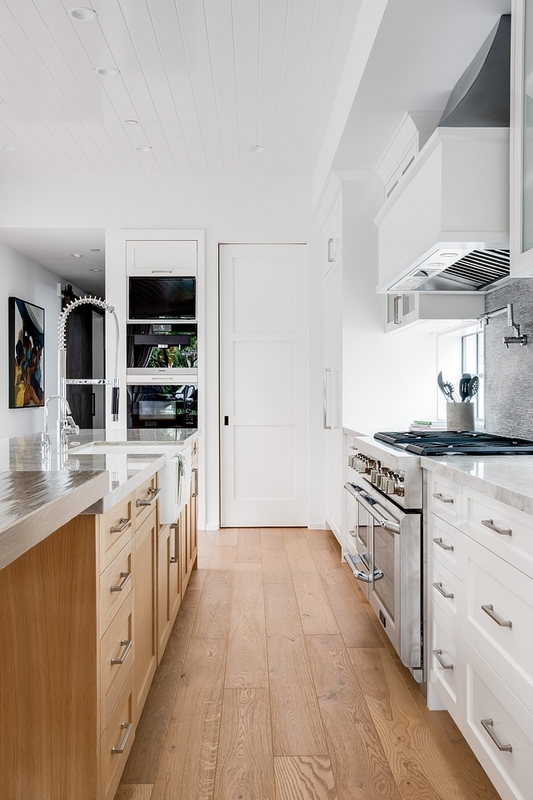 The cabinets are shaker style in rift white oak. Upper cabinets have wire mesh insert. Hardware: Alexander Pull by Emtek. Bobbin chair by Aesthetic and upholstered in a Jim Thompson’s Stitch In Time fabric and Zimmer & Rohde’s Darnell fabric with a Samuel & Sons cording – similar here, here & here. The fireplace features limewashed brick and a dark stained beam as mantel. Accent pillows are custom, in Zimmer & Rohde’s Meli-Melo Fabric and Nina Campbell’s Umbria Assisi. High Quality Pillows: here, here, here, here, here & here. The living room opens to a beautiful dining area. 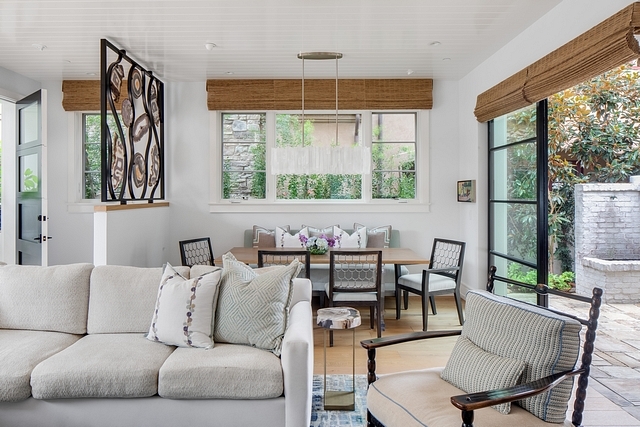 Window Treatment: Automated natural woven shades throughout the majority of the home. 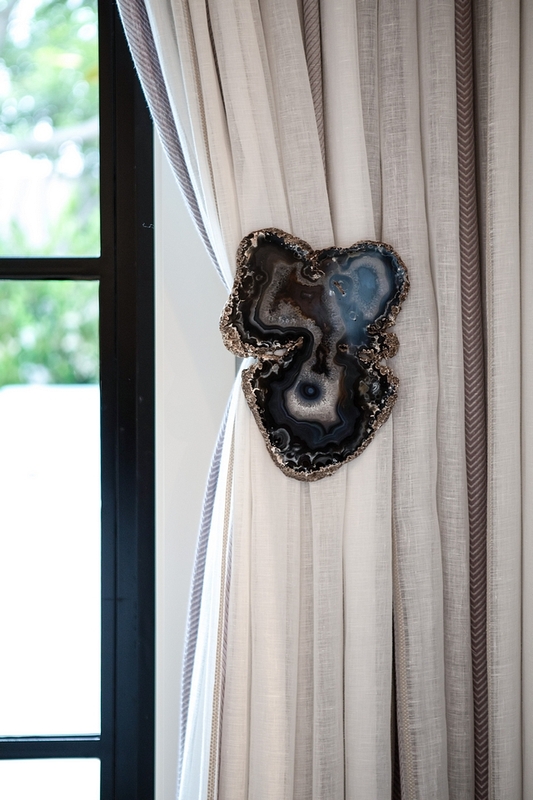 Entry Screen: Since the entry area is quite small in this home, we designed a custom agate screen alongside Ron Dier Designs in order to create a separation between the entry and the rest of the home. Used this as an opportunity for a unique design piece to immediately set the tone for the home. Dining Room: Dining table is custom designed, made of live edge wood slab and acrylic legs that compliment the natural selenite chandelier. Others Dining Tables: here, here, here, here, here, here & here. Color Scheme: Colors coordinate with the living room with purple accents. Banquette and dining chairs upholstered in a durable and stain resistant Glant fabric. 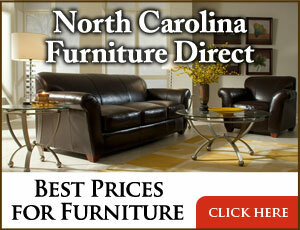 Dining chairs are Robert James Brasilia Dining Chair – Others: here, here, here, here, here & here. Custom pillows in Zimmer & Rohde’s Meli-Melo fabric, and Samuel & Sons Tenga and embroidery trim. Chandelier is Custom Selenite chandelier by Ron Dier Designs – Others: here, here, here, here & here. Large steel and glass bi-folding doors open seamlessly to the entry courtyard creating a great indoor outdoor entertainment space. 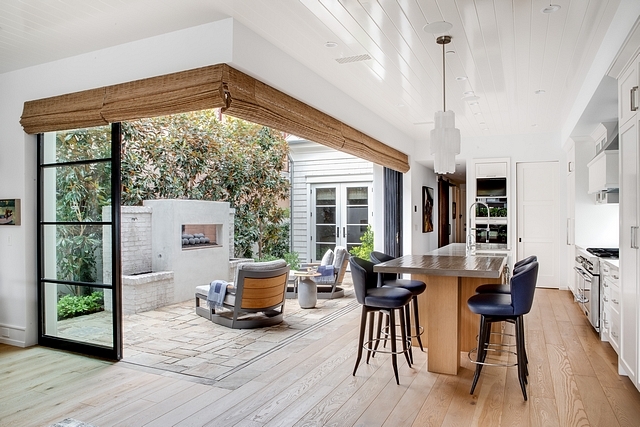 I love the layout of this kitchen! 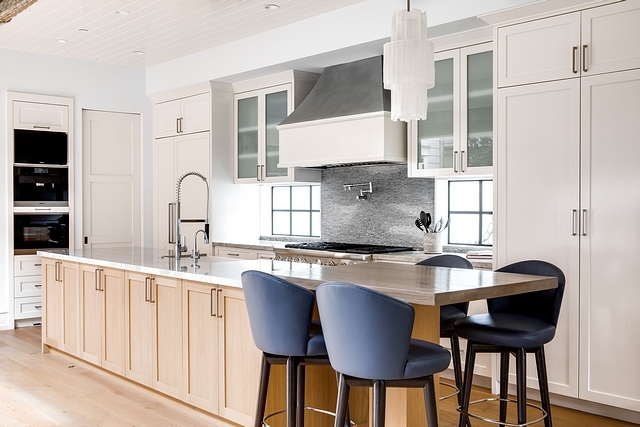 Kitchen cabinets are shaker style painted in Benjamin Moore’s Atrium White. Kitchen island cabinets are shaker style in rift white oak with light wire brushing. A pocket door conceals the pantry while a custom built-in cabinet features a TV, the built-in coffee maker and the microwave oven. 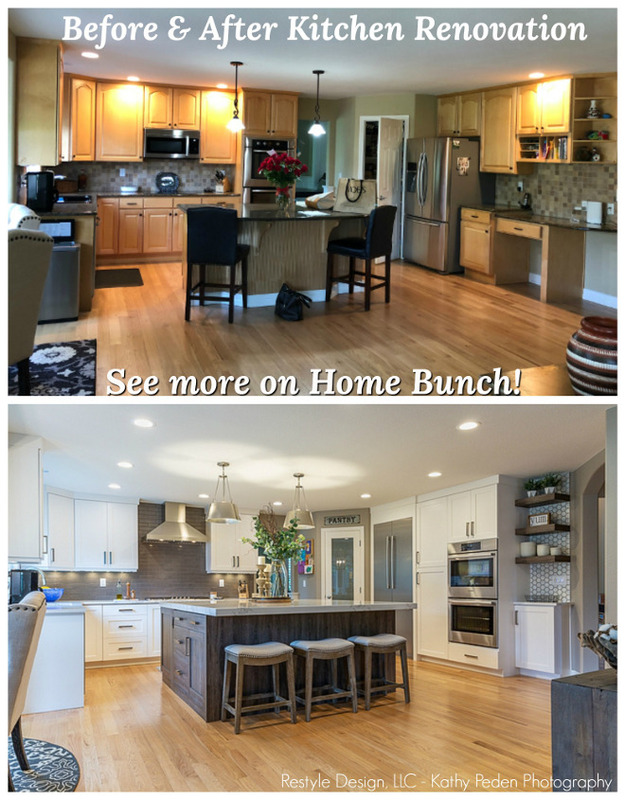 Kitchen Faucet: Rohl – Similar here & here. Wood floors: Gaetano Wood Floors in a custom finish Color/Style: 8” wide, custom finish – Similar: here & here. 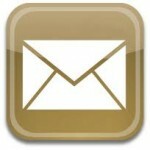 Appliances: Thermador range, freezer, refrigerator and dishwasher. 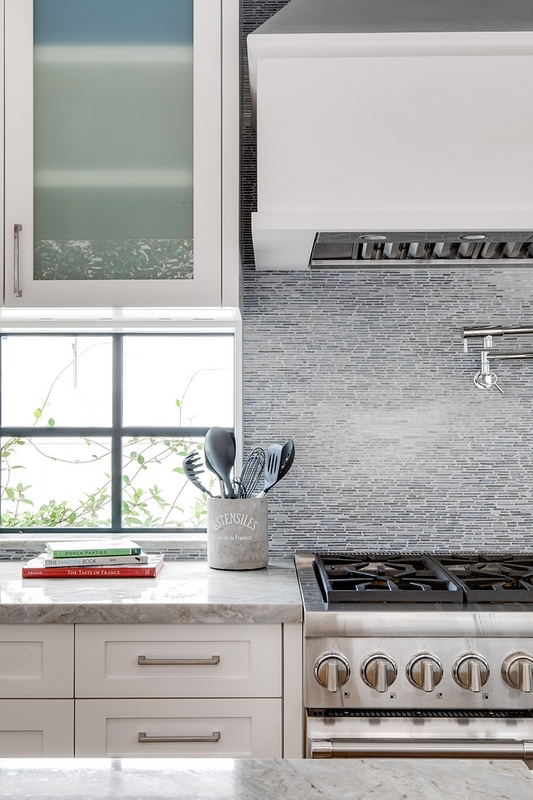 The backsplash is a custom mosaic tile made of Blue Macauba Quartzite – Other Beautiful Tiles: here, here, here, here, here, here, here & here. Pot Filler: Rohl swing arm pot filler faucet above range. Utensil Crock: here – Others here. 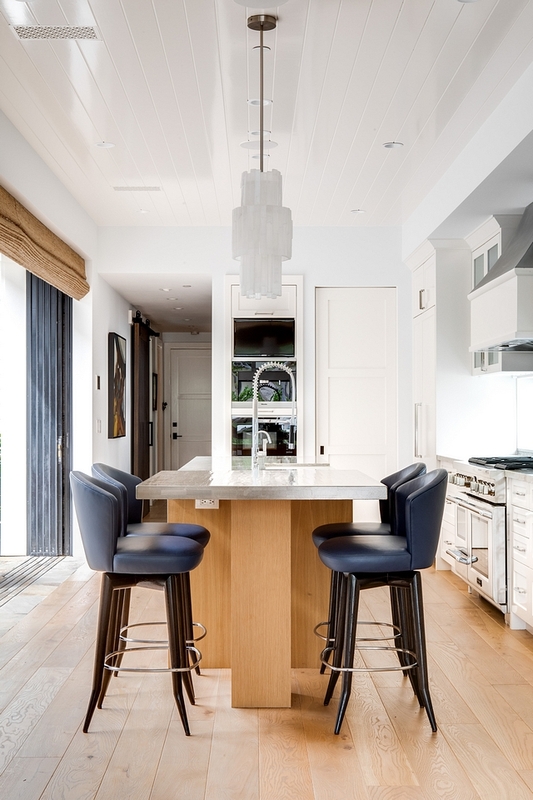 The kitchen island also features a custom stained and hand planed built-in table attached to island. Counterstools: Custom-designed bar stools by Marbello Designs. Leather is Navy blue leather from Pavoni – Others: here, here, here, here, here, here & here. Lighting is custom Selenite pendant by Ron Dier Designs. 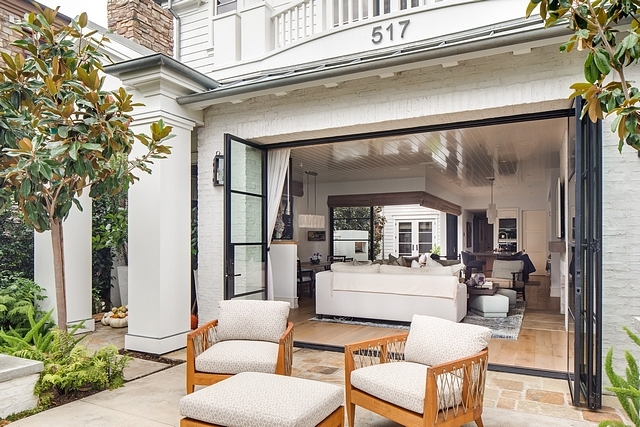 The bi-folding patio doors open to a private courtyard. 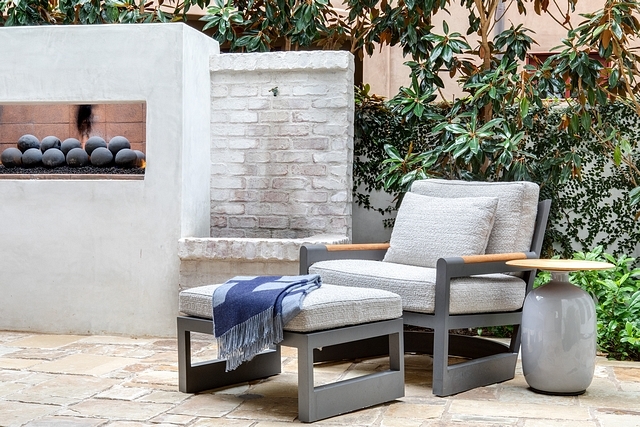 Outdoor chairs from Sutherland Furniture are upholstered in a cozy Perennials outdoor fabric. The built-in fireplace has water features on both sides. 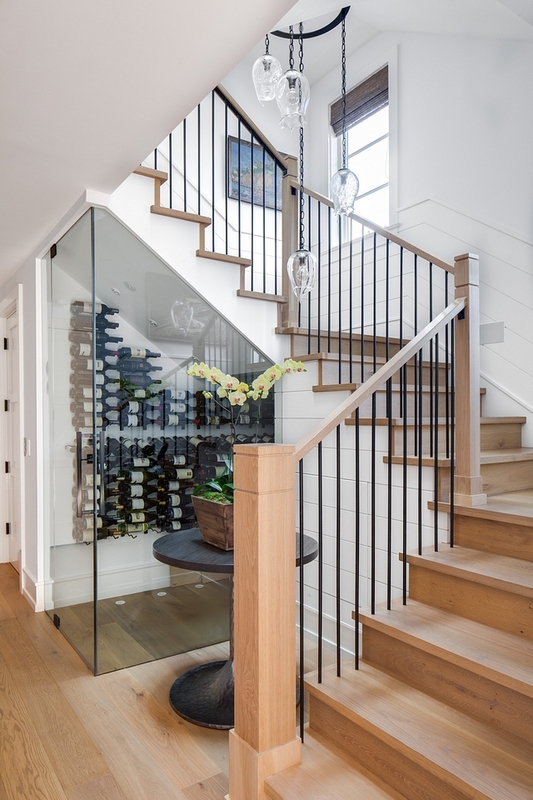 Adding a wine cellar underneath the staircase was a good use of space, but also an interesting and beautiful design component. The wine cellar’s steel doors are the same style as the steel doors that open up onto the front yard and side patio. All trim and wainscot in Atrium White by Benjamin Moore. The study features Tongue and groove coffered ceiling and a large barn door designed to mimic the ceiling details. Beautiful Barn Doors: here & here. Desk is custom designed by Anne Michaelsen Design with acrylic legs and knobs and side panel details matching that of the barn door. Beautiful Desks: here & here. The study’s paint color is a light lavender – Hampshire Rocks by Benjamin Moore. Custom slip covered sofa in a Glant Fabric’s Mantova – similar here & here. French doors open up to the courtyard. 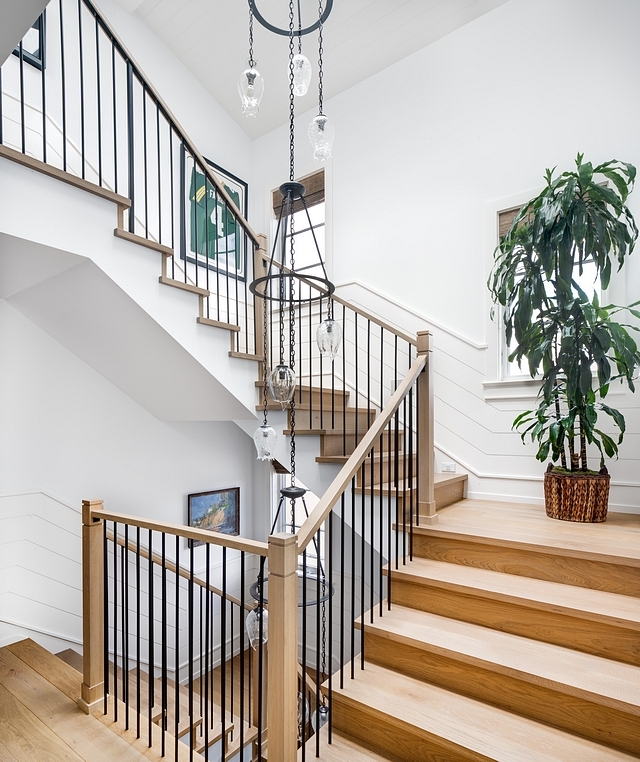 The staircase features White Oak treads, White Oak posts and railing with metal spindles. 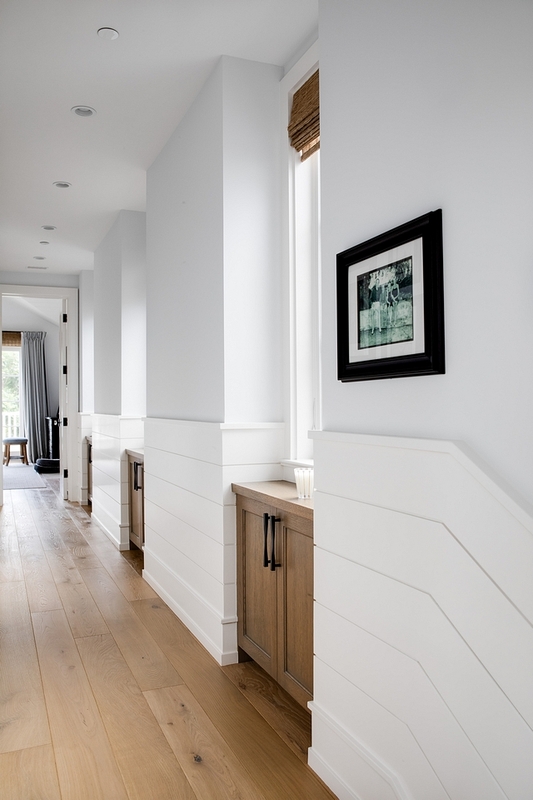 Walls are horizontal shiplap wainscoting. Lighting is custom three-tiered globe and steel chandelier by CX Designs. How fun is this powder room? 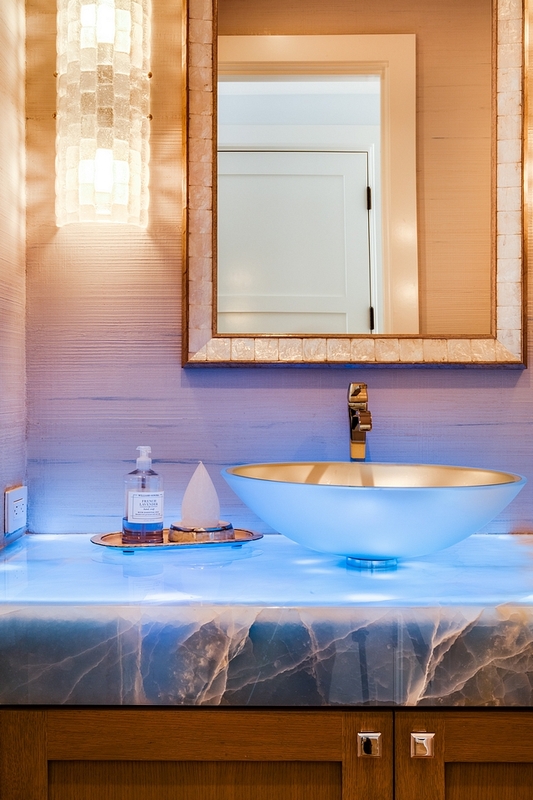 It features an impressive Blue Onyx waterfall counter illuminated by light strips installed under countertop. Edge is 6” thick. Walls are embellished with hand applied plaster and paint in a grasscloth-like pattern. Cabinet is Shaker style in rift white oak with custom finish. Lighting: Constructivism Sconce by Fine Art Lamps. Faucet: Gessi Mimi Collection – similar here. 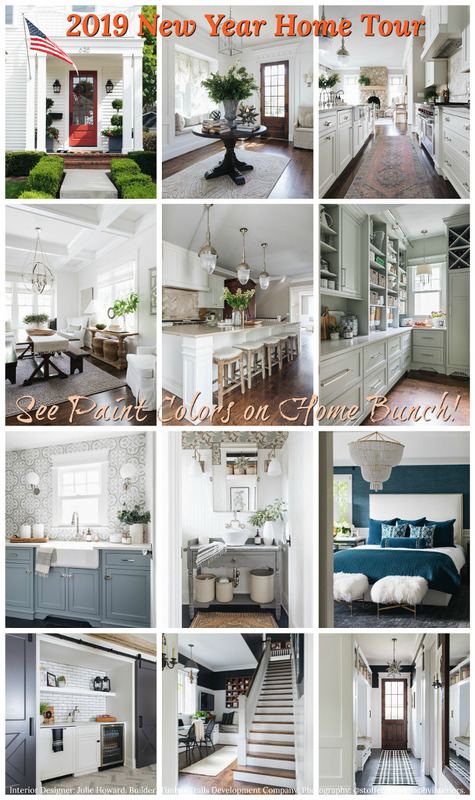 Majority of house is a very light blue/gray- Lily White by Benjamin Moore. Second story ceilings are Atrium White by Benjamin Moore. Custom cabinets are Rift White Oak, lightly wire brushed in a clear finish. Hardware: Twist Pull by Omnia. 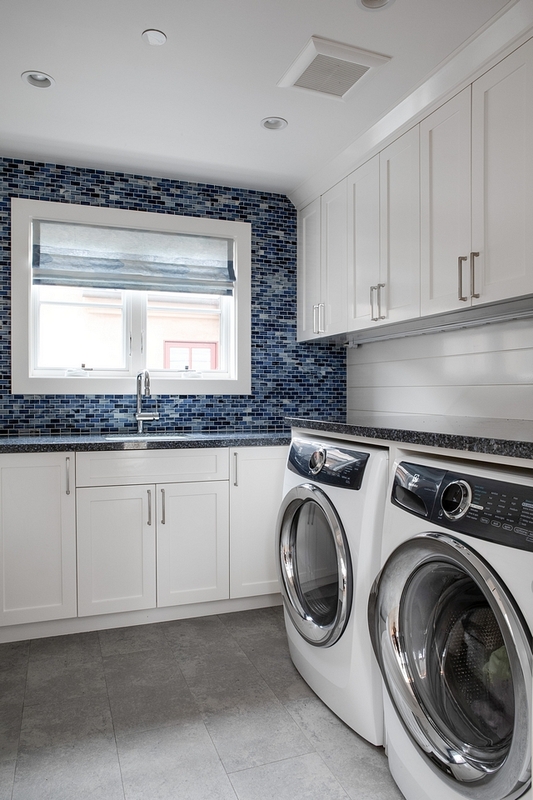 This spacious laundry room features shaker style cabinets, painted in Benjamin Moore OC-145 Atrium White, and a mix of shiplap and mosaic backsplash tile. Laundry custom roman shade in Zimmer & Rohde’s Laurence – similar here. 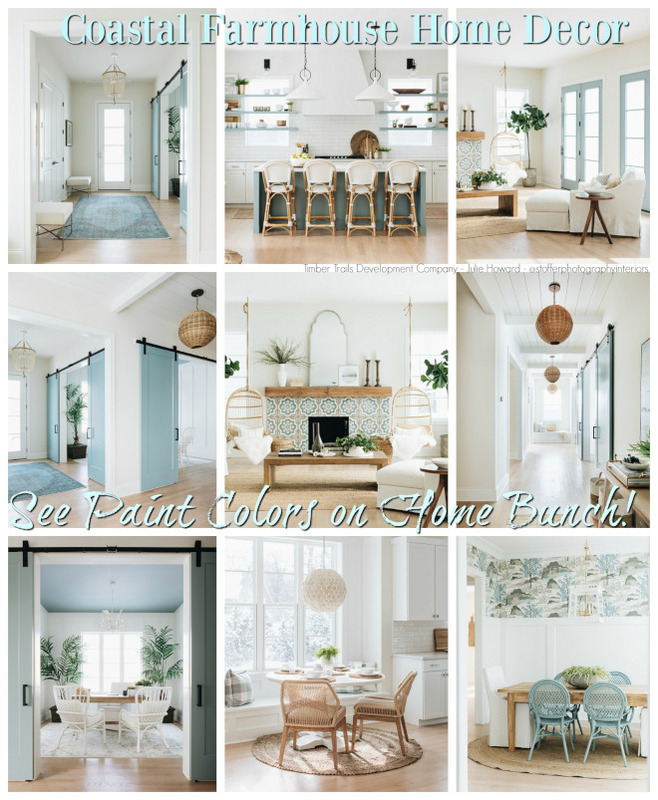 Blue Mosaic Tile: here & here – similar. Tile: Pure gray porcelain 12 x 24 tile. 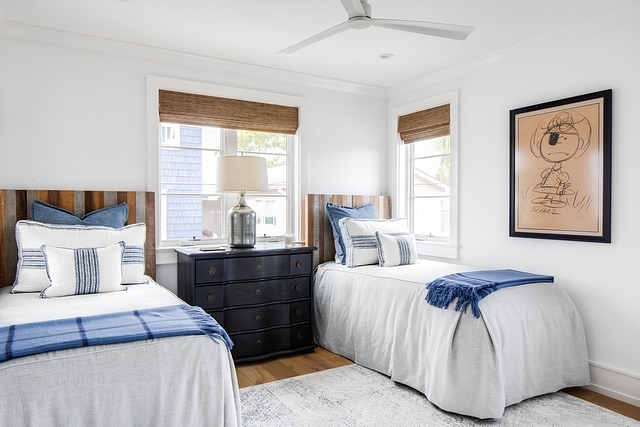 This guest bedroom was designed for future grandchildren with twin beds. Custom bed covers designed to keep the beds looking tidy. Pillows in Zimmer and Rohde’s Surrey Stripe fabric and Tinto fabric. Throw blankets: Serena and Lily. Countertop is made of a terrazzo-like engineered stone with numerous ocean colored specs of recycled glass. Faucet: Gessi Via Manzoni – similar here. Acrylic Hardware: Positano Pull by Schuab Assa Abloy. 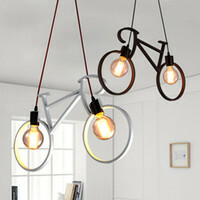 Lighting: Vogue lights by Modern Forms. 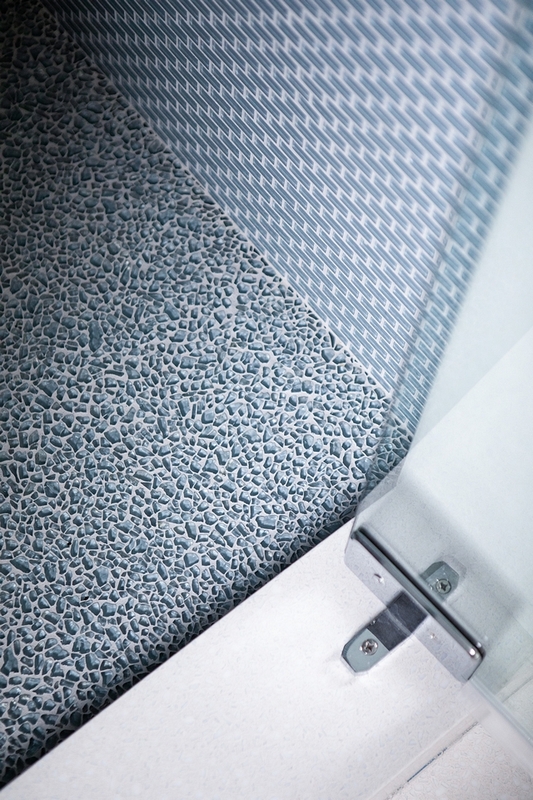 Tile: Terrazzo-like engineered stone with numerous ocean colored specs of recycled glass 12 x 24 – Others: here. Tile: Blue glass pebbles on shower floor with blue glass mini bricks on the walls. Beautiful Glass Tiles: here, here, here, here & here. 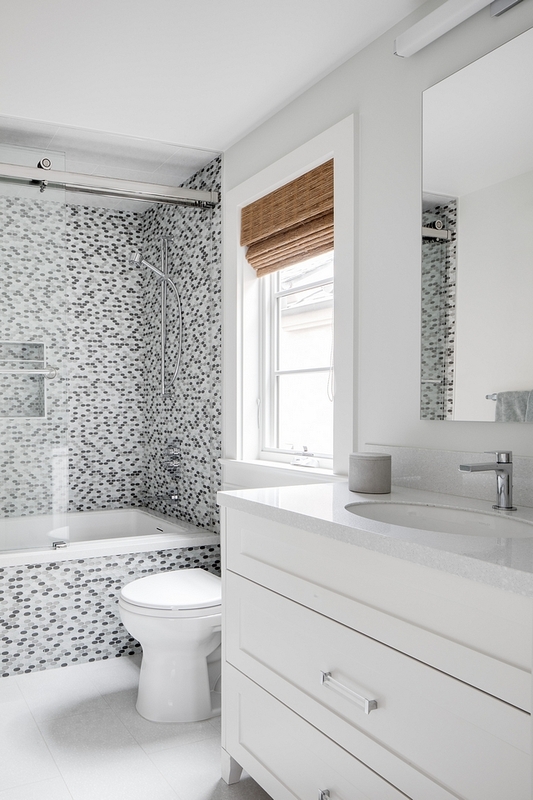 This bathroom features a custom white vanity, painted in Benjamin Moore Atrium White and oval mosaic tile in shower and tub front. Similar Vanity: here, here & here. Walls are wallpapered in a purple grasscloth. 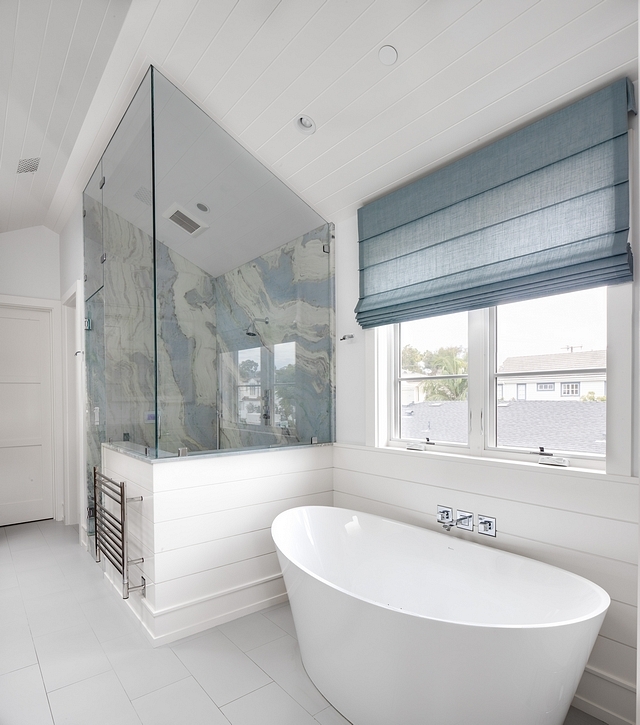 Limestone countertop and floor with mosaic mother of pearl on shower walls. Cabinet is Shaker style in rift white oak with clear finish and wire mesh insert. Beautiful Wallpaper: here, here & here. 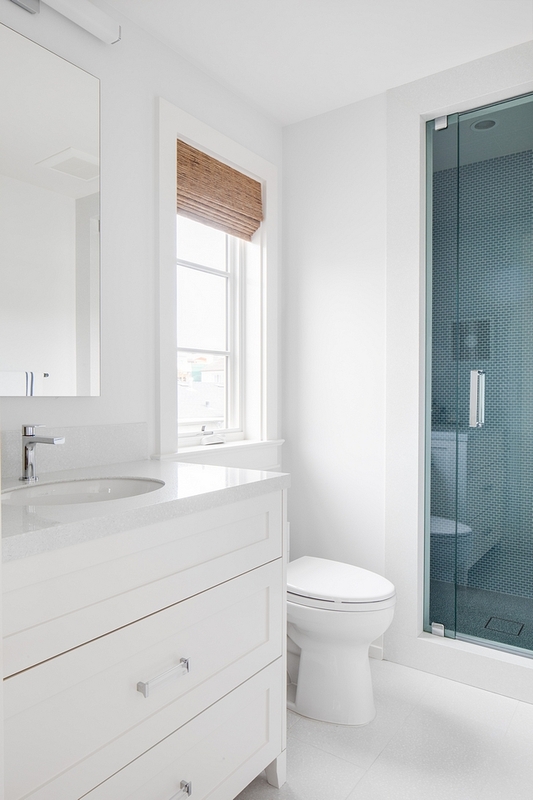 Shower Tile: here & here – similar. Tile: Limestone – similar here. Lighting: Ashton Sconce by WAC Lighting. 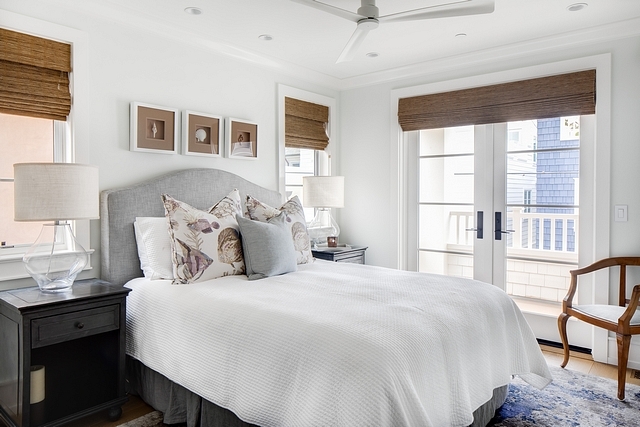 This bedroom features coastal inspired colors and patterns. 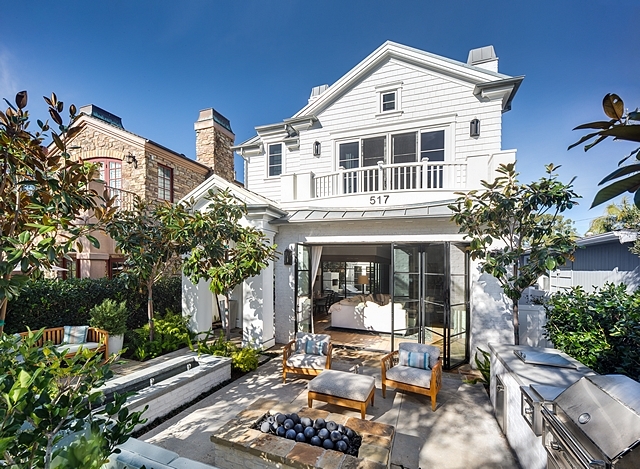 French doors open up to balcony with ocean view. 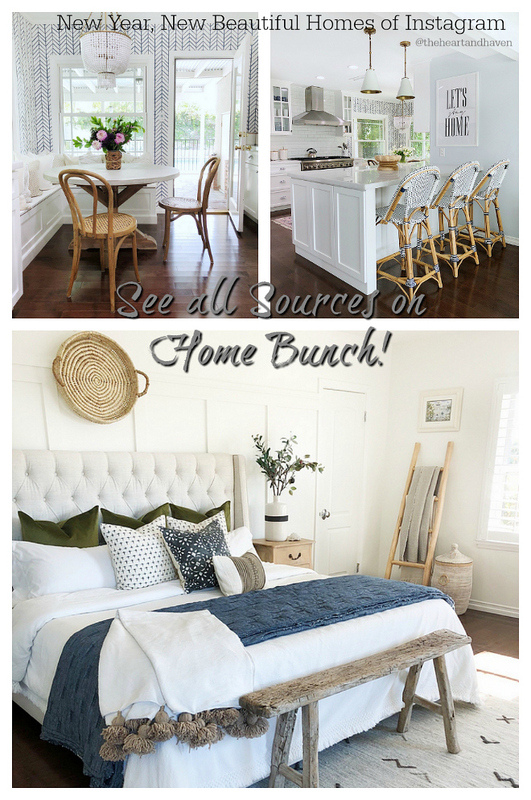 Headboard by Restoration Hardware – similar here & here. Pillow fabric by Zimmer & Rohde, pattern Archipel. Beautiful Bedding: here, here, here, here & here. 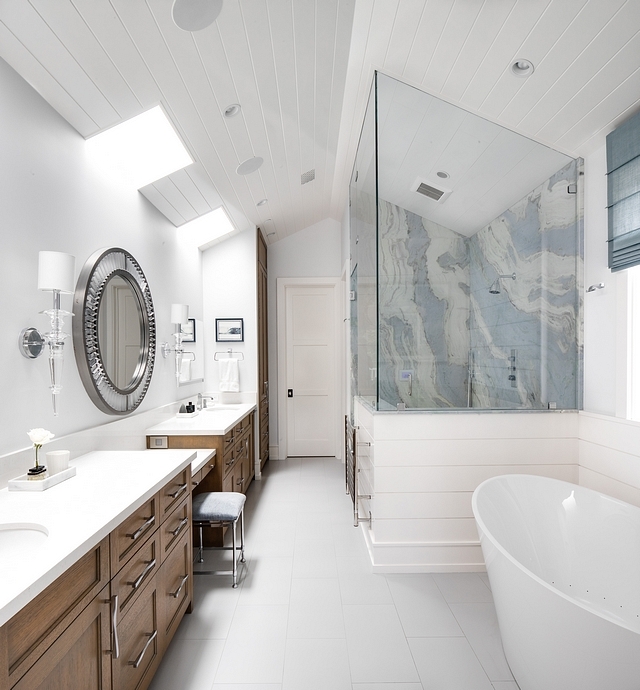 The master bathroom is spacious and features custom shaker style cabinetry in rift white oak with custom finish. Skylights let in light. Custom cabinetry in a custom gray washed finish. Countertop is white Quartz. 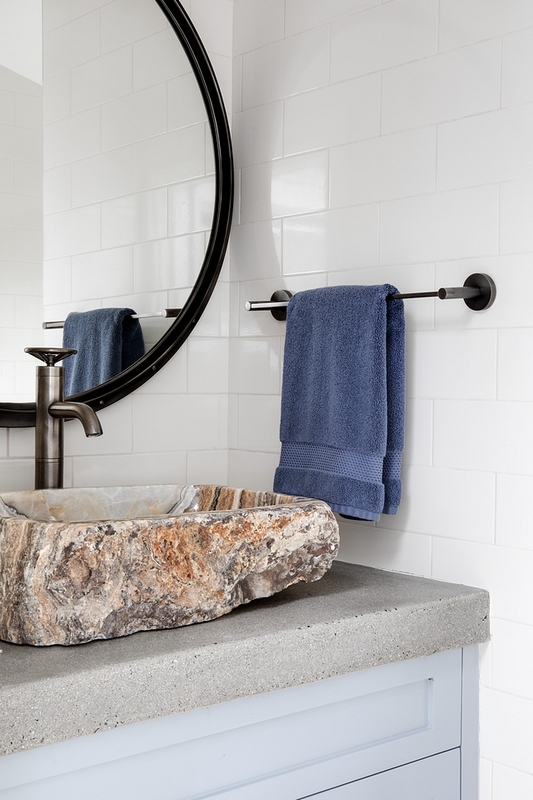 Bathroom sconces are Kingswell by Minka. Cabinet Hardware: Twist Pull by Omnia. 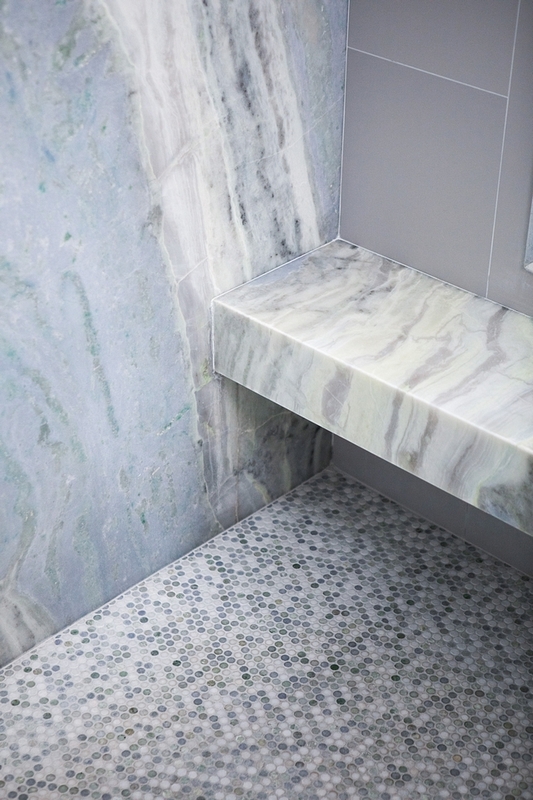 Tiles: Shower features full slabs of Blue Macauba Quartzite with hints of blue, green, and purple. Roman Shade: Custom roman shade in Romo Fabric’s Haiti Fountain. Shower floor made of custom colored marble penny tile – similar here. An elevator leads you to the rooftop. The elevator features Hartman and Forbes wallpaper and an acrylic handle. Elevator is accessible from all three stories. 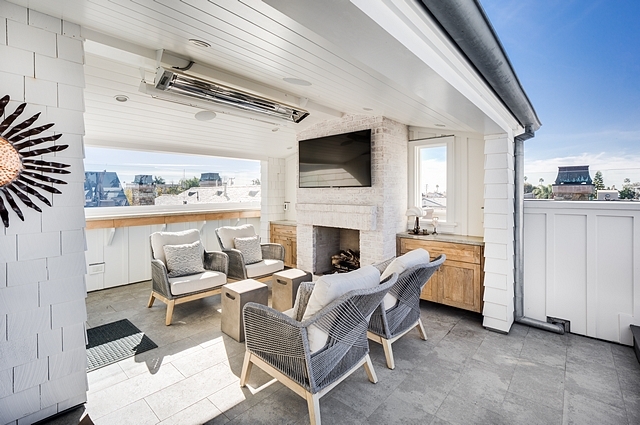 The rooftop features covered and non-covered areas, a TV, built-in bbq, under counter refrigerator, ice maker, sink, counterspace, sofa and lounging area, built-in fireplace. What a dream!!! Covered area contains built-in heaters, cabinetry, and a fireplace. 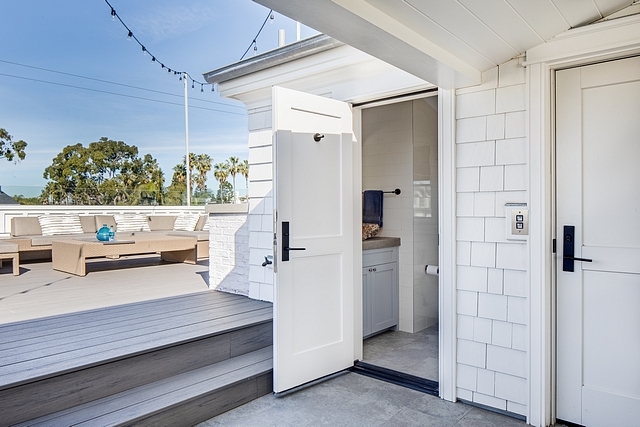 Roof deck cabinetry: Shaker style in rift oak with clear finish. Chairs by the fireplace by Orient Express Furniture. Concrete Accent Stools: Pottery Barn. 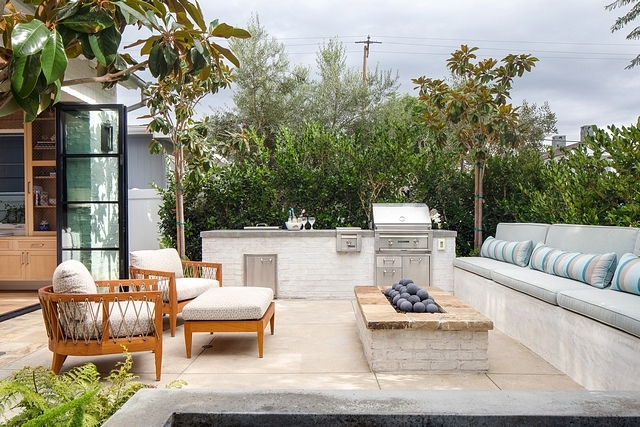 This entire space is perfect for outdoor dinner parties and bbqs. Outdoor appliances are Uline and Lynx. 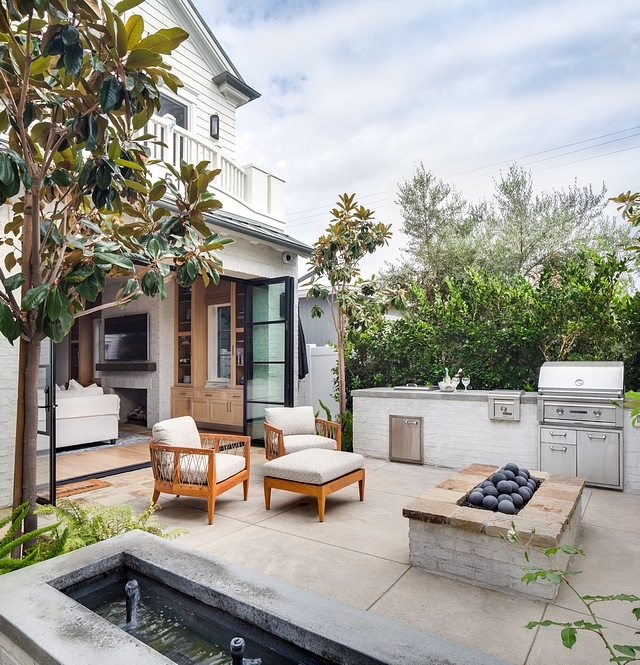 The outdoor sectional, coffee table, dining table and chairs are Brown Jordan – similar here. 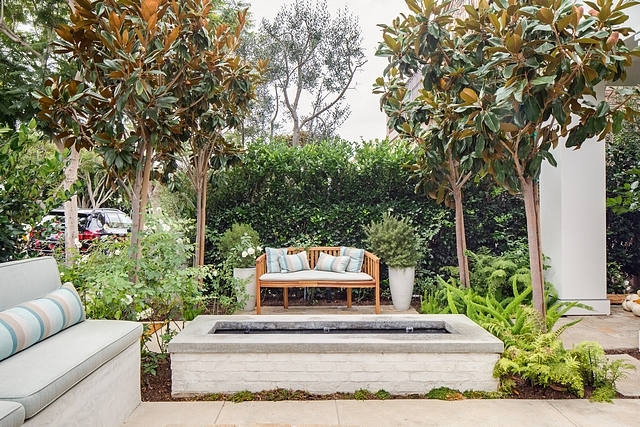 This outdoor space also features a bathroom. Rooftop bathroom features and hand carved stone sink, concrete countertops and floor to ceiling subway tiles on all walls. Many thanks to the interior designer for sharing all of the details above. 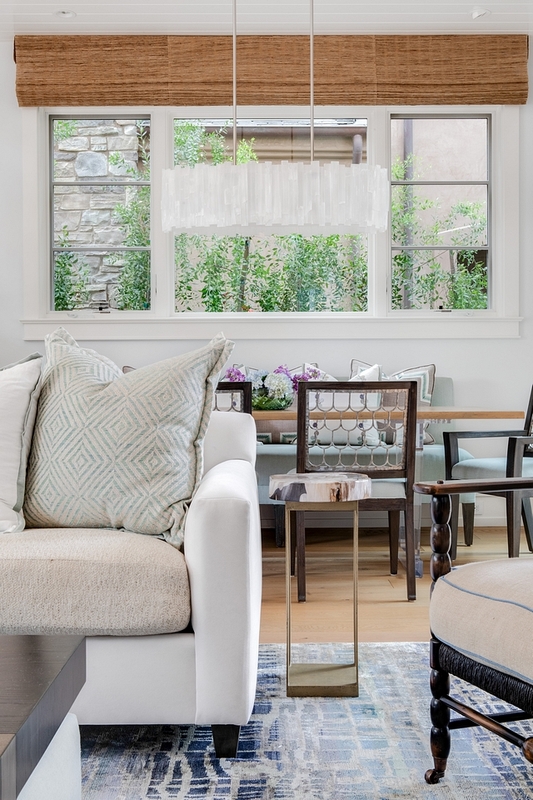 Interiors: Anne Michaelsen Design Make sure to follow her on Instagram & Facebook. Serena & Lily: Enjoy 60% Off hundreds of sale styles! 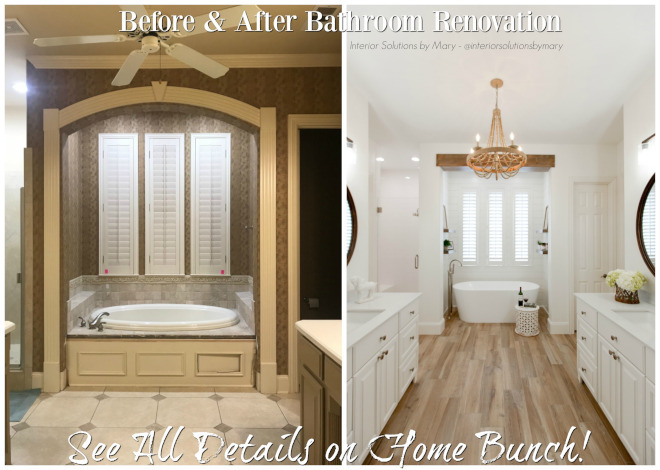 Before and After Bathroom Renovation. New England Home. Kitchen Renovation with Before & After Pictures.